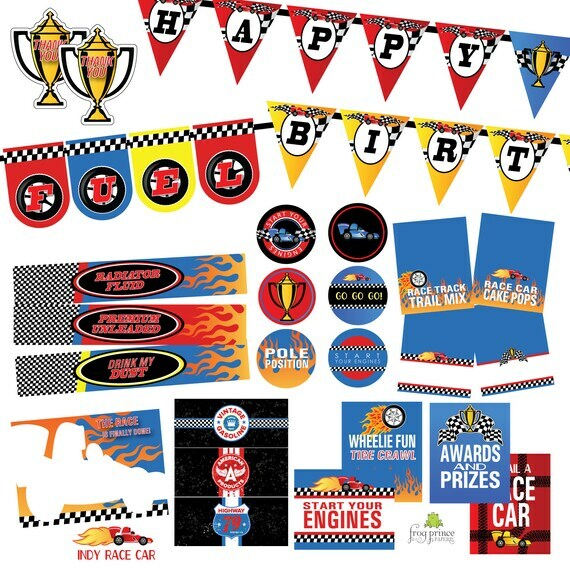 Indy Race Car action for a speed filled birthday party! Race cars, flames and checkered flags in primary colors are revving to go. This is an instant download, sold as-is, without any customization! THIS IS AN AS-IS INSTANT DOWNLOAD - NO CUSTOMIZATION COMES WITH THIS PACKAGE! The files are formatted to print on 8.5x11 white cardstock. You’ll need a printer (your or the nearest office supply store’s), and a sharp pair of scissors or paper cutter and A7envelopes to match your thank you notes. 2inch circle scrapbook punches are needed if you don't have a steady hand with your scissors!